Rejoice, it’s National Pie Day. OK, we know this is a US based national day but we still think it gives everyone here a brilliant excuse to indulge in one of the UK’s favourite dishes, and we have our own British slant to share. Delve into our blog filling to find out a little more about this ancient meal. Pastry pies made with flour and water first became popular in Ancient Greece, but the Egyptians had also wrapped sweet honey fillings with baked ground oats. Who made the first pie in history is arguable, we’re just glad they did. The famous slow-baked Cornish Pasty has been the staple lunch of workers since the end of the 18th century. Cornwall proudly holds an EU PGI (protected geographical indication) for Cornish Pasties. The EU directive means that only one English county has the right to call their pasties Cornish. Criteria dictates this filling pastry must be D shaped (for easy handling) with crimping on one side and packed with wholesome ingredients of beef and root vegetables. Some of our most fantastic mouth-watering experiences include pies, like our Brewery Tour and Beer Tasting for Two. What could be better – time out with a mate to learn all about the traditional brewing process, try out plenty of beers along the way and sit down to a meal with a pie? Desperate Dan, one of the many much loved characters from The Dandy was a great pie lover. The Dandy comic, first published in 1937, bought a British cowboy superhero to the masses. The world’s strongest man used to love eating cow pies (a meat pie with horns) which gave him his strength. He is immortalised in Dundee city centre with his own statue. 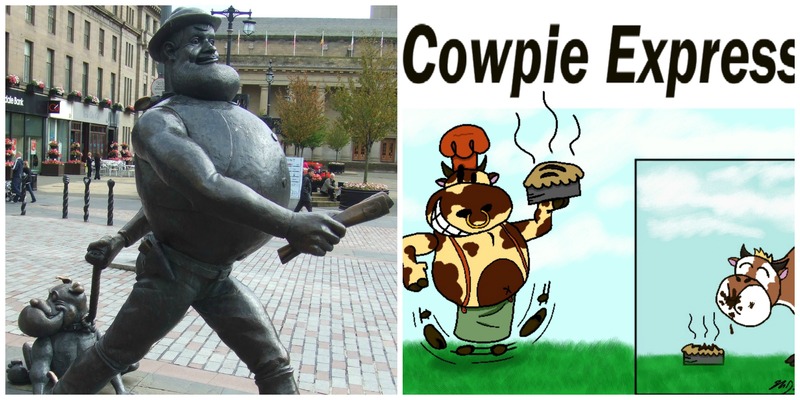 Desperate Dan statue in Dundee Town Centre and his favourite food – cow pie! Our other pie themed fascination is seeing someone get one in the face. Pieing as it is known has caught many a celebrity off-guard. In the UK targets include David Icke, Jeremy Clarkson, Rupert Murdoch and Anne Widdicombe (amongst other politicians) and Americans Bill Gates, Calvin Klein, Karl Lagerfeld and actress Lucy Liu have all been pied. Even royalty is not immune as Carl XVI Gustaf, King of Sweden was pied on a trip to Holland in 2001! 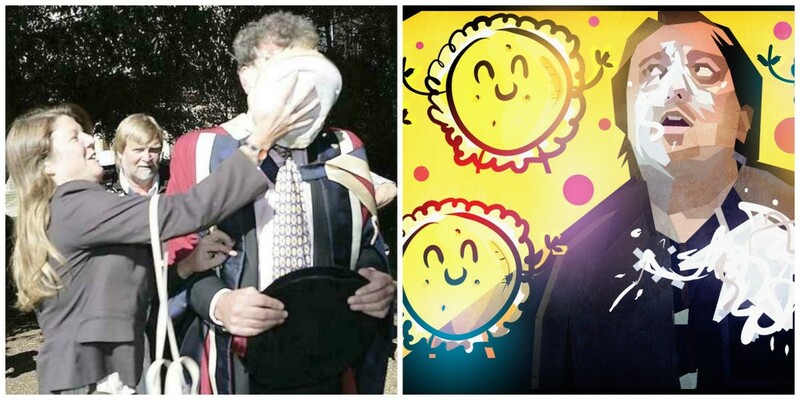 Jeremy Clarkson, pied in 2005 by an environmentalist. Jonathan May-Bowles pied Rupert Murdoch in 2011 and was jailed for six weeks. Who would you like to pie and why?